With the sporting world mostly focused on The High Holy Weekend of NCAA basketball, last night I took in the Wizards game. I enjoy college hoop…to a point…but, truth is that I’d rather watch a regular season NBA game than an NCAA tourney game. The tournament is fun with its single elimination format, but the level of play just isn’t there. Think about it like this: let’s say you want to hear a musical performance tonight. And let’s say you have a choice between say Beyonce (or fill the name of your favorite singer/band) or the best kid at your local college. Which one would you choose (assuming both are free)? That said, I still love the NCAA tournament because of all the randomness. I estimated Duke as a roughly 75% favorite against Mercer, yet the Blue Devils are going home and Coach K was on the bench with that “holy crap I’m gonna get clobbered in the press for this” look on his face. But, I’m way off topic. The Wizards are en route to their first playoff berth in a few years, and their best season since they had guys like Antawn Jamison, Caron Butler and Brendan Haywood. All season, I’ve been bothered by the significant quality difference between the NBA’s conferences. Washington is a solid playoff team in the East, but would be on the outside looking in if they were in the West. Pretty straightforward. When teams play against an Eastern Conference opponent, they win 55% of the time. When they play against a Western Conference opponent, they win about 45% of the time. That W82 is wins per 82 games. A perfectly average team playing against Eastern Conference opponents could expect to win 45 games over an 82-game season. That same team would win roughly 37 against Western Conference opponents. Only four teams this season have a better winning percentage against Western Conference opponents than they do against the East — the Clippers, Miami, Brooklyn and Cleveland. The Wizards have the league’s fifth highest East vs. West differential. Against the East, their winning percentage is .610. Against the West, it’s .370. The teams with bigger differentials: Boston, New Orleans, Detroit and Portland. Against opponents in the East, Washington plays like a 50-win team. Against the West: 30. That’s significant. In other words, Washington is fortunate to be in the East this year. By the way, I’m not saying the Wizards need to apologize for their schedule. All they can do is play who’s on the calendar for that day, and they don’t have control over opponent incompetence or organizational tanking decisions. Even if the league seeded the playoffs without regard to conference affiliation, Washington would make the post-season (as the 15 seed, but still). Here’s this week’s Player Production Average (PPA) update. PPA is a metric I developed that credits players for things that contribute to winning and debits them for things that don’t — each in proper proportion. PPA is pace adjusted, accounts for defense and includes a degree of difficulty factor. In PPA, 100 = average, higher is better and 45 = replacement level. PPA is a per minute stat. 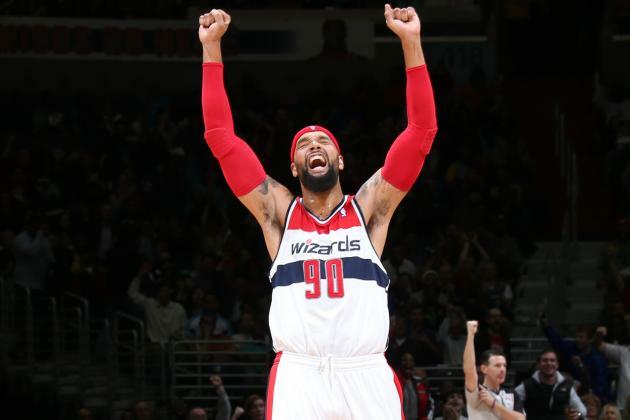 Drew Gooden has been an excellent scrap heap pickup for the Wizards. He’s played just 171 minutes so far, but those minutes have been at a borderline All-Star level. Very bad things have been happening defensively when he’s in the game, which bears watching. Bad defense has been a rap on him throughout his career. The Wizards saw production dips this week from Bradley Beal, Martell Webster and Andre Miller. Al Harrington continues to get minutes, and continues to play very badly. I’d hope that the Harrington experiment ends when Nenê returns. If the big man comes back healthy and ready to play, head coach Randy Wittman will have a nine-man rotation of Wall and Miller at PG, Beal and Webster at SG, Ariza and Webster at SF, Nenê, Gooden and Booker at PF, and Gortat, Nenê and Gooden at C. That still probably won’t be enough to win a first round series, but it should be good enough to at least make things competitive and fun to watch.